Streamline and view your data in one seamless, sensor agnostic platform. Utilize real-time sensor data to track, predict, and make informed decisions. Get a complete view of your water quality in real time. 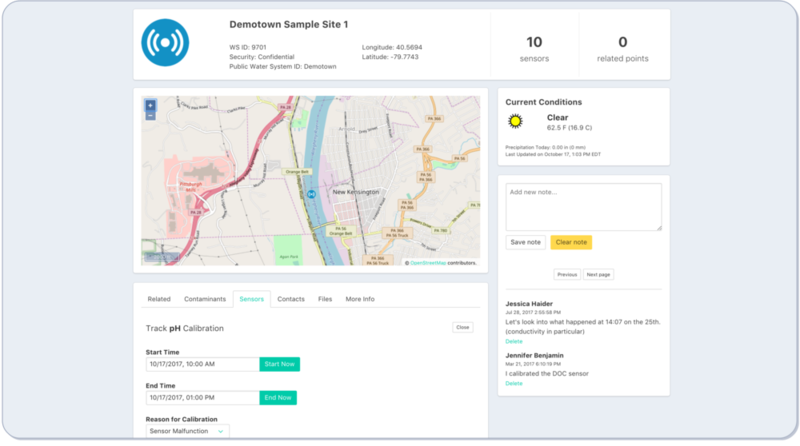 Display data from multiple sources, including online monitoring stations, and grab samples in one central location. Detect abnormal behavior from sensors in your network with instant warnings and alarms alerting you to communication issues, flatline readings, and control limit exceedances. Save time by navigating to your water quality data from a detailed map within this module. Access most recent values for a sensor location and easily launch sensor data charts. Make better decisions by tracking multiple parameters against specified control limits, various time periods, and multiple sites. Use real-time data to highlight critical events and to respond to abnormal patterns. Empower your team to be proactive. Attach files, manage notes, and record calibration history for specific sensor sites within the platform.